Another year, another Assassin's Creed. Ubisoft hasn't shown any signs of slowing down on annual releases for the series, despite handily finishing its main story arc. Correctly identifying the best innovation of Assassin's Creed III as its naval combat, this latest title incorporates it as the defining feature and centers the narrative around pirate adventure in the early 18th century. 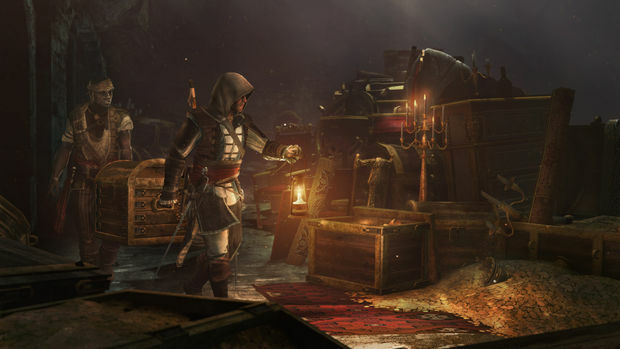 Edward Kenway is unique in the realm of playable Assassin's Creed characters in that he is neither an Assassin nor a Templar, but a pirate who holds allegiance to none but himself, seeking to find fortune and an easy life. He becomes embroiled in the affairs of the two organizations when he encounters an Assassin and kills him, taking his robes and assuming his identity long enough to learn of a great treasure being sought by the world's secret powers which would set Kenway up for life, provided he can get there first and sell to the highest bidder. The main campaign follows Edward as he hunts down this treasure, another piece of technology left behind by the precursor race which once controlled all of humanity, while working with other pirates to establish a new republic free from the control of kings and governors. It's a meaty adventure which should take players around thirty hours to accomplish, assuming they attempted to do little else. As a story, it is perhaps not as powerful as Ezio Auditore's battle with the Borgia or Connor's participation in the American Revolution. That's a problem with having nearly all your lead characters be self-serving criminals; it makes it harder to feel compassion for anybody. Further, both the Templars and Assassins, while central to the plot, take a backseat more befitting their status as secret societies. 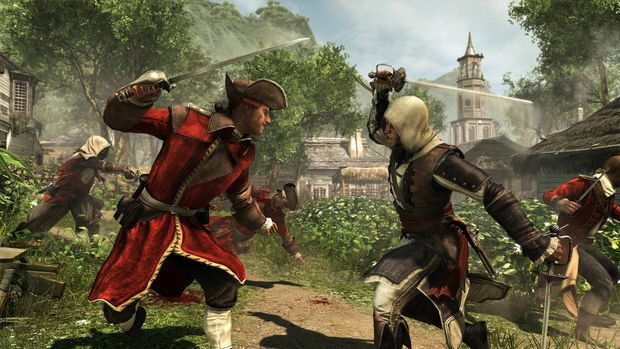 Their presence and involvement is known, but they operate more in the shadows at a distance which (with the exception of an Assassin-focused secondary quest line) gives them less direct interaction with Kenway and opens the door for an expansion of the game's world beyond the simple black-and-white conflict that pair have engaged in for centuries. That's probably for the best, because the game makes no bones about characters within the simulation describing the more science-fiction aspects of the Assassin's Creed world. Plot elements once fiercely guarded as secrets are now almost casually discussed between characters who have awareness of such things, an occasionally flagrant reminder that this is as much a game about high technology as historical fantasy. Kenway's status as an outsider caught between factions dovetails neatly with the game's broader, modern-day narrative, the telling of which has dramatically changed in this installment. Having completed the story of Desmond Miles in Assassin's Creed III, players no longer assume his role, but that of an unnamed employee at Abstergo Entertainment whose job it is to perform genetic memory research and relive the adventures of Edward Kenway for use in Animus-produced, commercial "experiences." Presented in a first-person view, these segments outside the Animus are some of the most entertaining the series has yet seen. A parody of the modern game development industry, Abstergo Entertainment is filled with references to the perceived culture within and behind game studios. There are also computers to be hacked in a series of simple mini-games, unlocking supplemental materials which enrich the history of the Templar-controlled parent corporation and open the door for endless future courses the franchise could take. 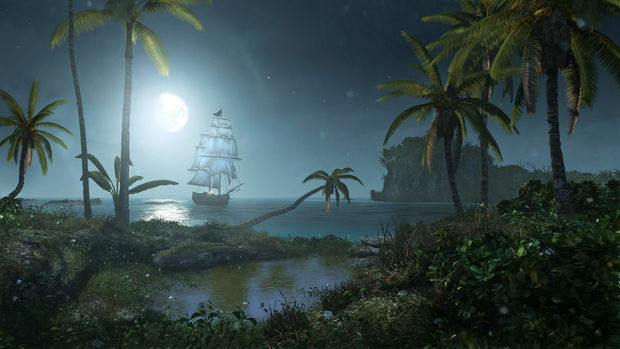 While exploring the pirate history of the West Indies, players will find their time neatly divided between land-based activities and seafaring ones. The game's world is -- as expected of Assassin's Creed -- mammoth in scope. More than half a dozen large land masses exist to explore on foot, from bustling ports to ancient jungle ruins where players can hunt, take on assassination targets, and seek out hundreds of collectibles which litter the landscape. These exist within a larger, oceanic map with dozens of additional, smaller ports, coves and islands and vast stretches of open sea populated by European fleets. Exploring the seas turns up more activities the player can engage in with more variety in their gameplay. 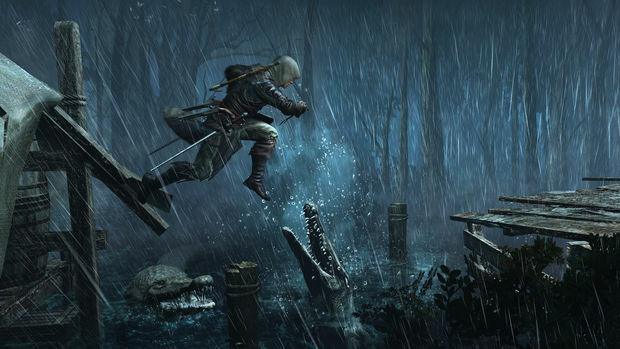 Locations where sharks and whales can be harpooned put Kenway on a rowboat to engage the beasts in tense, thrilling combat. A diving bell acquired midway through the campaign allows the exploration of shipwrecks which hide treasure and plans for powerful ship upgrades. The underwater areas have some issues, mostly related to lighting being so poor as to be completely disorienting, but offer a nice challenge in the more difficult regions of the map. And then there are more violent activities. Any ship is a potential target for piracy, carrying goods which can be sold or used to upgrade Kenway's ship, the Jackdaw. Ship battles require a bit of strategy in approaching targets, as you can easily become surrounded and overwhelmed if half-cocked, and it's supremely satisfying when a plan pays off. Ships which are defeated in combat can be sunk for half their cargo or boarded by the Jackdaw's crew. Boarding will bring the two ships together and require the player to kill a certain number of enemy crew members and other objectives such as destroying the enemy ship's flag and powder magazines. Captured ships can then be used to repair the Jackdaw, reduce notoriety and prevent enemy hunters from tracking the player, or press it into service in Kenway's Fleet, a trading sub-game similar to a trading system found in Assassin's Creed III (and equally dull, but totally avoidable for all but the completionist). Boarding ships will likely be, for many, a high-water mark of excitement for when they first encounter the activity. Swinging on a rope from one ship to another, landing on two soldiers (killing them instantly) and drawing swords to deal with the half dozen more surrounding manages to retain its luster for a surprisingly long time, and it can be hard to resist attacking every ship which moves into view to get another taste of that instead of traveling on to the next objective or activity. For the first time in Assassin's Creed history, Black Flag is incredibly respectful of the player's need to cross great distances with a minimum of mucking about. Unlocking fast travel to a map location is as easy as visiting it, with no additional climbing puzzle or maze to traverse. Additionally, every "synchronization point" (a vertically high perch which, when reached, reveals surrounding map details) serves as an additional fast-travel location. Land-based activities in the campaign suffer from feeling more or less the same, one mission to the next. Most follow a formula of tailing a target, usually without raising their awareness, until such time as valuable knowledge is gained or they are otherwise safe to eliminate and while some other diversions do exist, such as the occasional silent infiltration, a bit more variety would have been welcome. Environments are designed to offer a range of paths to accomplish the objectives, allowing the player to stalk at ground level or at height in most circumstances, and Eagle Vision (an ability which lets Kenway identify targets and mark them so that they remain highlighted at all times) plays a much more prominent role, though it doesn't always seem to work as well as intended or even at all in some parts of the game, failing to establish a lock on enemies regardless of how clear the view to them is. 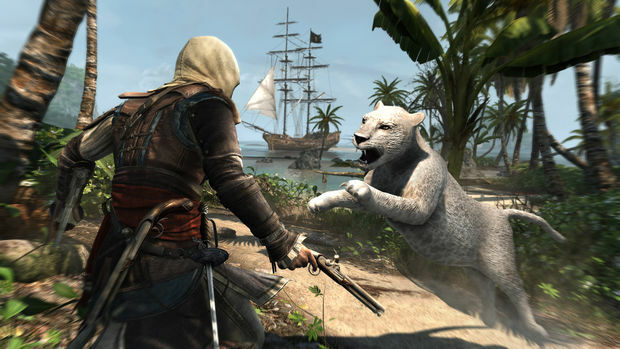 It can be difficult to tell when the game might reward or punish the player for their actions, as Black Flag sometimes appears to have a flexible definition of its own rules. A target being tailed may or may not observe a violent combat encounter happening thirty feet behind their backs. Passing directly in front of a guard in a restricted area may or may not immediately impel them to action. The level design of these missions is frequently excellent though, with plenty of patrolling guards and lots of opportunities to dispense with them silently or with style. Should the player be spotted and need to lose unwanted attention, they'll find a more aggressive enemy on their hands. Guards don't give up on tracking down as easily as in past games and they'll continue to hunt for a short time once hidden, fanning out and checking spots until their interest is diminished. They're also pretty fast in a foot chase and able to tackle Kenway and surround him with ease on a long sprint. Hand-to-hand combat remains simplistic, with commands for attacking, countering, and breaking enemy defense being all that's really necessary. Crowded conflicts can be chaotic and it's very easy to accidentally switch targets midway through a combo, making these battles a bit frustrating at times but rarely challenging. Secondary weapons such as smoke bombs, pistols and the rope dart return and can spice things up a bit, but fighting enemies directly is typically less satisfying than picking them off from concealment. Multiplayer offers more of the same, "hide-and-seek" competitive gameplay as has been found in prior editions. Sporting six game modes (all featured previously in the series' last installment) which twist conventional multiplayer games like Capture the Flag and King of the Hill with stealth elements unique to Creed, and eight maps on which to play them. While there's nothing revolutionary to be found in the selection, multiplayer remains a tense, thrilling experience whether on the hunt or in hiding. Sadly, all multiplayer content consists of on-foot gameplay and ship combat has not been made an option, which seems like a tragic missed opportunity. Rather than create new modes, Ubisoft Annecy has instead developed a "Game Lab" system which allows players to redefine the parameters of their games to create new experiences on their own. The depth of these options is highly impressive, allowing the player to set limits on abilities, change the amount of time actions take to perform, and even toggle HUD elements. Game modes players create can be shared with others, with popular modes appearing in a curated playlist. It remains to be seen how well the community of players takes to this feature, but the opportunity certainly exists for some creative game modes. Black Flag sports visuals which still manage to impress on aging console hardware, though not without some problems. Pop-in and some minor screen tearing occurred in our playthrough which, while acceptable within the narrative framework of the Animus, were certainly noticeable. Also, as bright as the brights are, darkness can be so total in some places that it's impossible to see anything but the outline of a highlighted enemy. These issues aside, the design is generally more vibrant, more colorful, and it's hard not to get caught up in the fantasy. This is accompanied by some exceptional audio, including a wide selection of sea shanties the Jackdaw's crew can be ordered to sing, making every voyage seem like a grand adventure. Open-world game design works best when the player feels as though something fun is just around any corner. 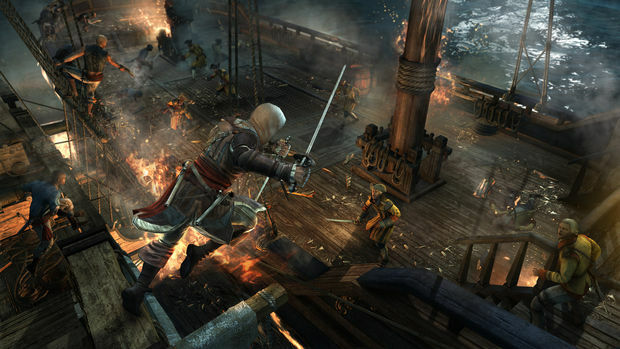 In this respect, Black Flag is the best Assassin's Creed yet. Strong environment design props up the well-worn, on-foot gameplay and the slightly more persistent enemy AI can present a decent threat to the incautious, but no real ground is broken on land. Sea voyages are the brilliant contribution to the formula, with a range of variety and challenge strong enough to remain compelling through the game's lengthy campaign and beyond, while the remainder is a more polished, streamlined experience than ever before.